In 10-inch nonstick skillet, cook chicken, taco seasoning mix, water and chiles over medium heat 5 to 6 minutes, stirring frequently, until chicken is heated through. Remove from heat. To assemble, spread about 2 tablespoons refried beans in bottom of each shell. Top each with heaping 1/4 cup chicken mixture and 2 tablespoons shredded cheese. Bake 5 to 7 minutes or until cheese is melted. Top with remaining ingredients, if desired. Try other varieties of Old El Paso™ taco seasoning mix, such as original or hot & spicy for something different. Try Monterey Jack or pepper Jack cheese for a flavor twist! We all know that tacos are the quintessential easy-to-make party food but easy doesn’t have to mean lack-luster. 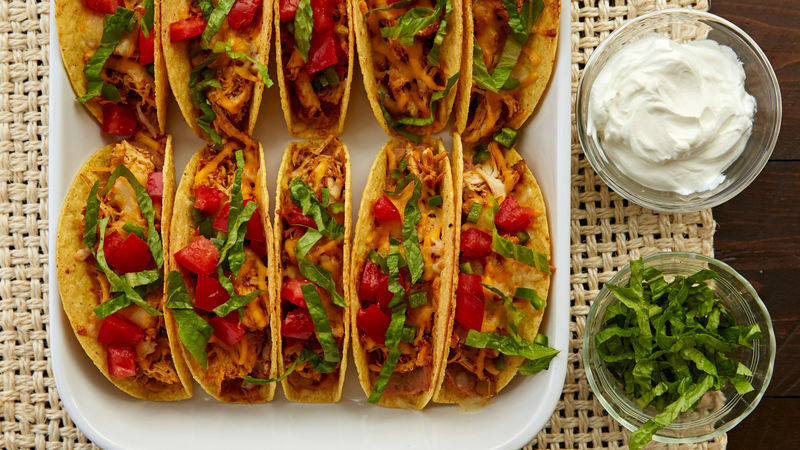 These oven-baked chicken tacos get their pizzazz from the slow cooker where zesty taco seasoning and robust fire-roasted tomatoes have hours to penetrate the meat—not possible with a quick sauté in a pan. Your guests will appreciate the time they think you spent coaxing those delicious flavors and no one has to know your slow cooker basically made this dish for you. Whether you're serving these tacos for an all-out fiesta or a simple weeknight dinner, we suggest serving it with rice, beans and oh yeah, margaritas. How could we forget?